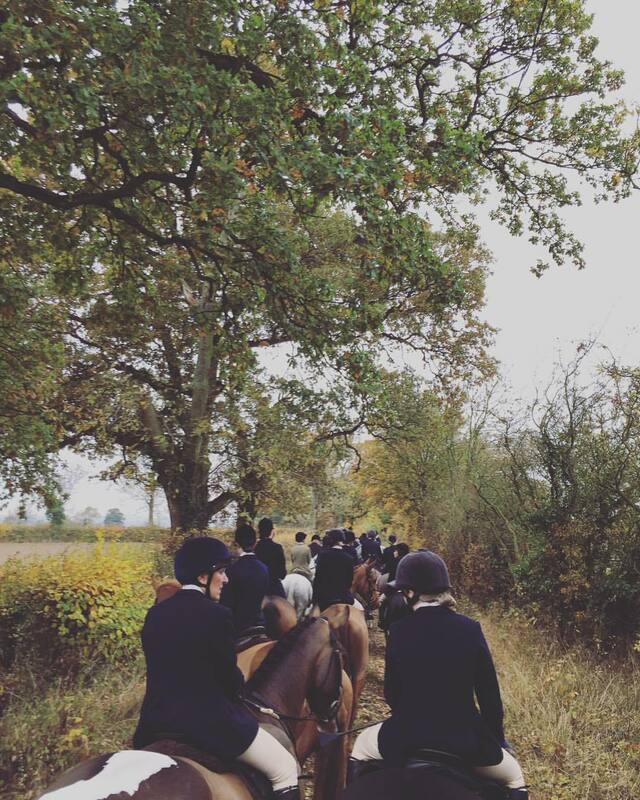 Now that Autumn Hunting is well under way in Britain and November’s opening meet is just round the corner, this is the perfect time to get clued up on the popular equestrian tradition of riding to hounds. Despite the fact that killing the fox with a pack of hounds is now in fact illegal, the sport of hunting continues to thrive. What is it that makes it so fun? Galloping around the countryside jumping things interspersed with periods of standing around having a gossip perhaps? First things first, you need to choose a type of hunting…. Post ban, most Fox Hunts have now adopted the practice of Trail Hunting. This involves following a pre-laid scent, usually based on fox urine, that mimics the path a fox would naturally take over a mixture of terrain through thick cover and across open fields. In order to keep the hunting interesting, gaps are left in the trail so hounds will have to “cast” around for the scent. The huntsman is not made aware of the exact trail beforehand only the country it aims to cover. The aim of Trail Hunting is to mimic the hunt practices pre-ban as closely as possible in order to keep old traditions and practices alive. Trail Hunting is most enjoyed by those who enjoy these traditional ways and the sport of watching the hounds work. Drag Hunting is when the hounds follow the scent of a rag dragged by a human across three or four different lines of around two miles, including ten to 15 jumps. Drag hunting is largely an equestrian based activity, so the lines are predetermined to be the most fun to follow. The pack and field will hack between the lines quietly to give all involved a breather. 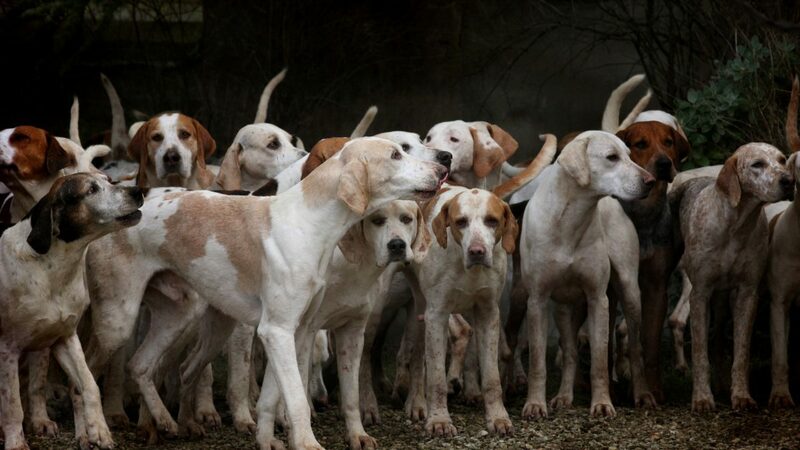 Packs used for this sport tend to be much smaller and can be either foxhounds or bloodhounds. Bloodhounds will simply follow the scent of the human runner. As a day out, drag hunting is similar to riding several cross-country courses, but in a herd. Whilst it is a friendly and fun day, the emphasis is on jumping, so it is better suited to more experienced riders and older children. The few remaining Stag Hunts are West Country around Exmoor and the Quantock hills. There is one remaining Buckhound pack in the New Forest who hunt fallow. Following the ban (2005), a day’s hunt now follows the practice of using hounds to chase a stag until he picks a spot to stand at bay at which point he is shot at close quarters. It is the job of the Harbourer to pick out a legitimate, warrantable stag beforehand and inform the master where he is laid up. Only older stags past their prime are chosen. Stag-hunts use a bigger version of the foxhound and tend to be very fast paced to follow—horses do tend to get left behind. The open moorland of Exmoor and the Quantocks does not have much in the way of jumping but does provide some long, fast, open gallops and spectacular views. Stag-hunts tend to have a lot of car and quad bike followers. On arrival at the meet say, “Good Morning” to the Hunt secretary, pay your cap and find out who is the Fieldmaster for the day. This is the person whom the mounted field will follow for the day. He/she ensures everybody only rides where there is permission to do so, doesn’t get in the way of the hounds working and generally stays safe. At all times you should endeavour to stay behind the field master! Try to arrive at the meet punctually so you can hear any announcements made about the day to follow. Standard attire for a hunt is cream jodhpurs, white shirt, stock and tweed hacking jacket for autumn hunting, black or blue jacket for hunting proper. Boots, tack and the horse itself should be clean, smart and, above all, safe. Saddle pads should be black or brown and preferably fitted. Ladies should wear hairnets. Traditionally, field plaits are for hunting proper only. Exact turnout will vary from hunt to hunt. If your horse kicks, tie a red ribbon in its tail. If the horse is young or new to hunting, tie a green ribbon. If your horse refuses a fence, immediately get out the way and let those who are approaching pass. Always turn your horse to face the hounds where possible. Pass messages back through the field, for example “Gate Please” means close the gate. Keep chatter to a minimum when the hunt is underway, particularly when the hounds are casting. Chatting is acceptable only if you are far from the hounds hearing, travelling between areas (e.g on roads or lanes) or at the meet. At the end of the day thank the hunt staff and say “Good night”—this is traditional at any time of day. The best breed for the hunting is always going to come down to a matter of opinion but by and large you will find the hunt staff, field masters and regular followers on sturdier types. Popular breeds are Irish Draughts, Irish Draught–Thoroughbred Crosses, Irish Sport Horses, Cobs, Cob Crosses and anything with a bit of native pony in it. These types are found to be the sanest in exciting situations such as galloping around hunting. They are also very sure footed, hardy and stand up to the heavy going, lost shoes and many knocks that come with the job. Many hunters in England are imported from Ireland. With all these confusing rules, the risk to your horse, the risk of him misbehaving and the many embarrassing and crazy tales every regular follower will have to share, why bother? Hunting is an immense adrenaline rush, there is nothing quite like it at all. On a good run, it is very much like galloping around a cross country course—that you haven’t walked—but with around 50 other riders. 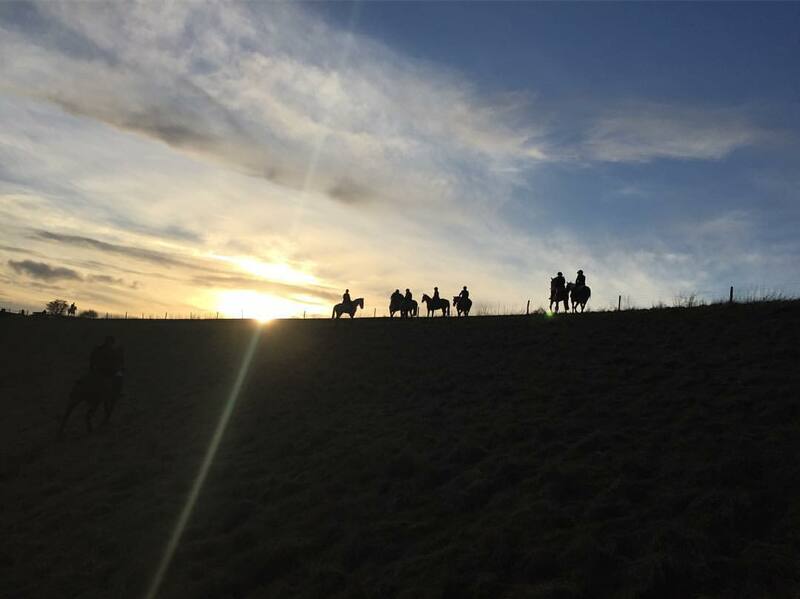 Meets on special days such as Christmas Eve and New Year’s Day with well-known hunts such as the Heythrop can have over 100 followers. For the horses, it can greatly increase their desire to go forward and confidence jumping whilst also teaching them to think quickly and jump carefully. For the rider, it teaches a good strong safe seat and to kick on and not interfere. It is also a great chance to ride across country you would never normally have access to, meet other local riders and get a chance to chat and catch up with friends. Many laughs, sweets, snacks and slugs of warming spirits are shared on the hunting field. Watching the hounds in full cry across a lightly frosted valley on a clear crisp winters day, followed by the hunt staff in their traditional red jackets and all the field, yourself amongst them, is a sight you will never forget. Hunting is a great English tradition, modernised to fit current times and still going strong. Be it Stag hounds, Drag hounds or Fox hounds it is all a special part of the British countryside and a sport worth trying. If nothing else, it is an experience you will never forget. 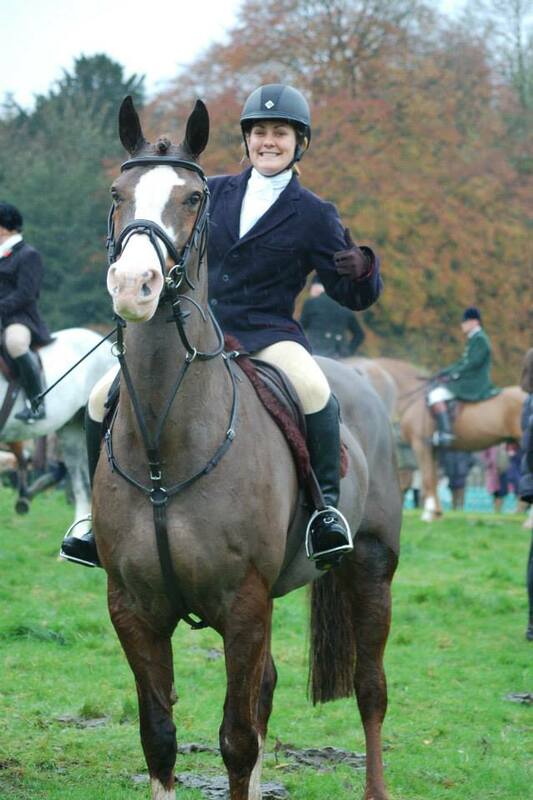 After 10 years working as a competition groom all round the world Becky has now taken a step back to care for ex racehorses part time while she pursues a new career in Equestrian and Adventure sports Journalism.